Is Trump Right About Afghanistan? A damning report on the United States’ attempts to stabilize Afghanistan has two lessons that resonate in the nearly-post-ISIS landscape of Syria and Iraq: Arrogant reconstruction timelines will doom the effort from the start, and meeting the local populations’ expectations about governance and services is key. More than 17 years into America’s war in Afghanistan, the Special Inspector General for Afghanistan Reconstruction, or SIGAR, released its fourth lessons-learned report, this one on stabilization. The conclusions are grim: “Despite some very heroic efforts to stabilize insecure and contested areas in Afghanistan between 2002 and 2017, the program was mostly a failure,” SIGAR chief John F. Sopko said Thursday at the Brookings Institution while debuting the report. The U.S. poured nearly $5 billion into stabilizing Afghanistan, intending to clear territory, hold it, and then build institutions. 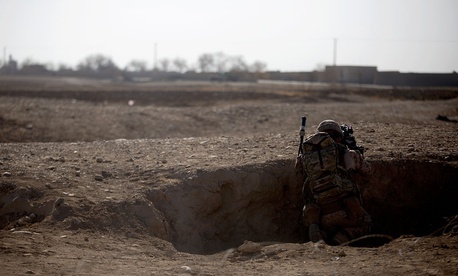 But by the time President Barack Obama’s administration completed the drawdown in 2014, Afghan forces and civil servants couldn’t compete with “the threats of a resurgent Taliban as the insurgents filled the void in newly vacated territory,” the SIGAR report says. “Let’s be realists about this,” Sopko said. When the U.S. government is looking at its roles in Syria and Iraq — or any other stabilization effort — they should be looking at it on a long timeline. Asked what he’d tell a president contemplating another hypothetical intervention overseas, Sopko offered Afghanistan as a warning. President Donald Trump has repeatedly said he wants to bring U.S. troops home soon. His administration reportedly asked the Pentagon to draft up plans to withdraw from Syria in the next six months, though military officials say there is no plan to do so. “The establishment of a set of unrealistic expectations about what we could do and what would be achieved in just a few years’ time,” doomed America’s efforts in Afghanistan, Sopko said. Aggressive timelines meant agencies “spent far too much money, far too quickly,” and the very programs meant to stabilize the country “often exacerbated conflicts, enabled corruption and boosted support for insurgents,” the report states. The Pentagon has said any withdrawal from Syria would be conditions-based, not tied to a timeline like the one President Barack Obama instituted to withdraw from Afghanistan by 2014. As the international community works to clear explosives from Raqqa and return basic services like running water to communities freed from ISIS, those efforts must meet residents’ expectations. “Winning hearts and minds requires a close examination of what has won and lost the hearts and minds of that particular population in the recent past,” the report says. But it also means being clear about the services promised and not leaving a vacuum that an extremist group can fill, cautioned Vanda Felbab-Brown, a fellow at Center for 21st Century Security and Intelligence. ISIS, for all its barbarity, provided governance and services that some communities are now having to do without.